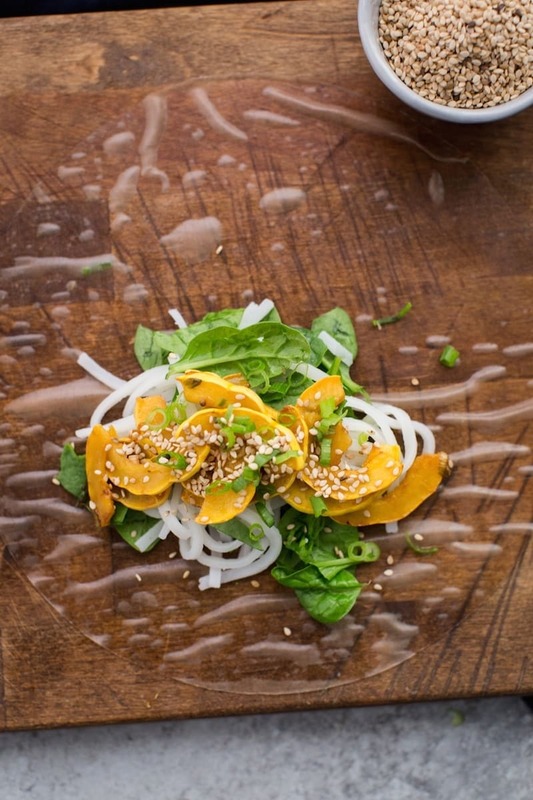 Delicata Squash Spring Rolls with Spinach | Naturally. As you read the title of this recipe, you might be thinking to yourself that the two main items, squash and spring rolls, don’t scream fast. Squash takes time to prepare and the wrapping of the spring rolls can be tedious. However, using delicata squash (no-peel, quick cooking) and a small batch of spring rolls means this meal can be ready in under 30 minutes. Preheat oven to 425˚ F.
Cut the squash in half lengthwise. Scoop out the seeds, and place cut-side down on a cutting board. Slice each half into half-moon slices, 1/4-inch thick. Place on a sheet pan, then toss with diced scallions and soy sauce. Roast for 15 to 20 minutes until squash is tender and beginning to brown. Remove from oven, and toss with sesame oil and seeds; let cool. Meanwhile, bring a pot of water to a boil. Cook noodles according to package directions. Drain, rinse slightly, drain again, then combine with the spinach. Set up your rolling station so you have the squash mixture, spinach-rice noodle mixture and a large, shallow bowl of hot water within easy reach of your cutting board. Soak a rice paper round for 10-15 seconds, until pliable but not extremely soft. (Soaking time varies depending on water temperature.) Place the round on your cutting board. 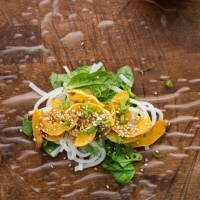 Arrange 1/2 cup of the cooked noodles and spinach mixture on the round, slightly off-center on the half closest to you. 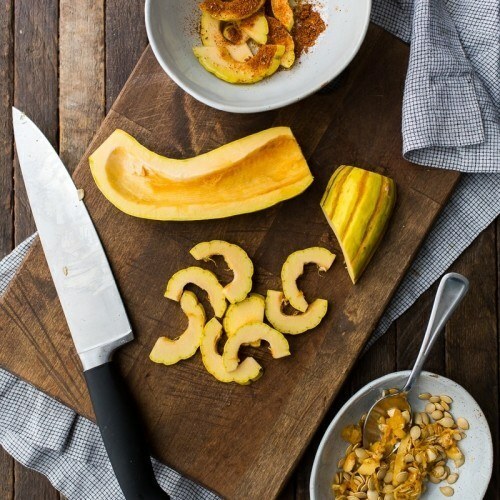 Top with 1/2 cup delicata squash. Fold the wrapper edges closest to you over the filling, tucking the edge under the filling. Fold the sides over and continue to roll away from you, like a burrito. Repeat with remaining ingredients. Slice in half to serve. Given the delicata cooks quickly, I really like to keep that as the focal point of these squash spring roll. However, there are a few additions and swaps that you can easily make depending on what you have on hand. Greens: I am a spinach lover and my favorite way to eat it is when it’s been slightly wilted by a minimal bit of heat. However, you could easily change out the spinach for chard/kale and also use the degree of tenderness you like. A fan of crisp greens? Cool the noodles completely before using. Want the greens completely wilted? Stir into the noodles before draining/rinsing. Noodles: My spring rolls almost always contain rice noodles. I like the substance they give to the overall roll. However, you can ditch them for additional greens or grains. I like quinoa in my spring rolls but it can get really messy. Rice Papers: This is more of a ‘hey look’ instead of a swap. Most stores carry white rice papers but I love brown rice paper wrappers. You can check them out on Amazon (but look for them in stores- 6 packages from Amazon is a bit extreme). I think by now, you might be a bit overloaded with delicata squash recipes from me but it seems to be my “it” ingredient this year primarily because of how easy and quick it is to use. It’s definitely a star ingredient- plan on using the skin and all. ||Recipe originally created for the San Jose Mercury News. 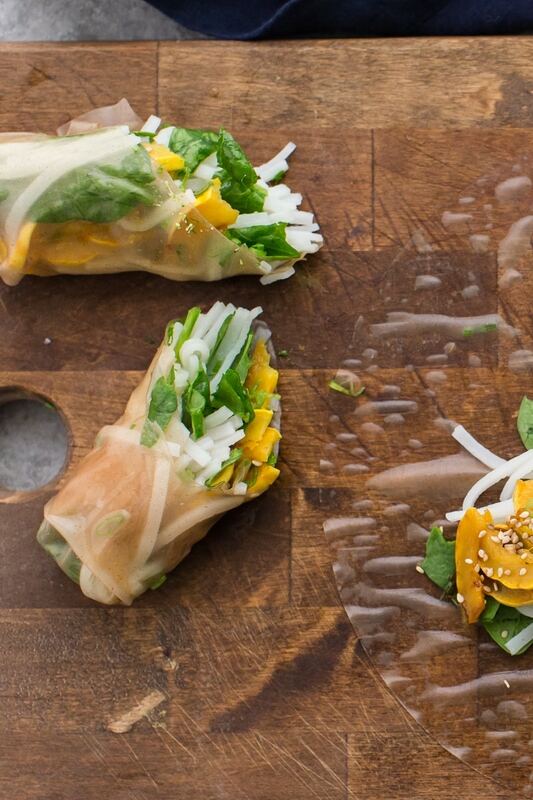 I love the inventive use of delicata squash in these spring rolls! Gorgeous. These look delicious. I’ve always found that if everything is prepped, spring rolls come together pretty quickly. If it’s not all prepped, it’s still delicious. Such a great recipe with delicious looking result. I really want to make these! Holy moly, these sound incredible! I was just telling my husband we need to start making our own spring rolls at home (the last two times we’ve gotten them out the veggies were not fresh at all!). This is a great first recipe for us! What a fun and unexpected combination of flavours for summer rolls, looks scrummy!